‘Volume to Value’ Change in Health Care: Threat? Or Opportunity? The ‘Volume to Value’ Change in Health Care: Threat? . . . Or Opportunity? Let’s face it. We live a culture of change. Dramatic change. And nothing seems to be changing as fast or dramatically as health care has since 2010 and will continue to do so over the coming years. So what is driving it, and does it bring opportunities or threats to physical therapists? The answer to that is up to you. The ACA has been a major source of political controversy between liberals and conservatives since it became law in March of 2010, and the controversy around it seems to mount daily. Over 20,000 pages of statute, rules and regulations. New taxes and more regulatory requirements of payers, providers, and individuals. Consolidation of payors. Integration of providers. Threats of reduced reimbursement. Pay for performance. Risk sharing. www.cms.gov. With the highly troubled roll out of the health care exchanges and Healthcare.gov website on October 1, questions have escalated. They now go beyond politics. It has become personal. For patients – Can I keep my chosen providers? What services will be covered? How high will my premiums rise? Will my employer continue to purchase my insurance? For providers like physical therapists – How will ACOs and health plans choose therapy providers? Will my practice be included, or will be left out? Will reimbursement be cut? Will my practice survive? But health care reform goes beyond the ACA. Change is driven by the people footing the bill. The people who pay for health care are driving Change because they don’t like what’s happening now. It’s too expensive for employers and their employees. It’s too expensive for those who have to buy it on their own. It’s too expensive for health plans and ACOs. PricewaterhouseCoopers (PwC), the world’s largest professional services corporation, reports that approximately 50% of US health care costs are redundant or unnecessary. Health care spending hit a whopping $3T in 2012 – $8,233/person. If PwC is correct, we spent about $1.5T on services that added NO VALUE to PATIENTS. www.pwc.com. But providers who delivered those services benefitted financially. The sad fact is that providers will continue to provide unnecessary services as long as they have a financial incentive to do so in a fee for service environment. Show me the money! The cost of health care is unsustainable for the government, payors, employers, and individuals. All of us. That must Change. But we have obstacles in the way of Change – misaligned incentives. Fee for Service rewards VOLUME. The more you do, the more you get paid. It creates a VOLUME SYNDROME. In other words, find a service that has a decent profit margin and do it as much as possible at the your lowest possible cost. The Volume Syndrome creates conflict. Providers try to Maximize it. Payors try to Minimize it. Incentives are misaligned. Let the battle begin, and the big dog in the fight usually wins. Fee for service creates “Provider Centered” behavior as providers of all types work to ‘game the system’. Unfortunately, provider centered behavior is NOT what payors want nor is it necessarily what patients need. Because “Provider Centeredness “is misaligned with payor AND patient needs, it is destined for conflict and long term failure. The Volume Syndrome is compounded in today’s environment by a Provider complacency. In other words, if patients can’t go outside the system, I will always be busy regardless of what level of service or quality I provide. So I’m going to do what’s most convenient for ME? COMPLACENCY plus VOLUME incentives create Provider Centeredness as far as the eye can see. No Patient Centeredness in sight. Even though ALL providers SAY they are ‘Patient Centered’, but their behavior SHOWS they are ‘Provider Centered’. Now patients are really upset. So are their employers who pay for most of their health care costs. They want Change. We must move away from Volume based incentives that reward provider centered behavior. Provider centered behavior driven by misaligned incentives is creating a consumer revolt. VOLUME to VALUE revolt in which incentives will begin to change across a broad spectrum. Change is coming. The VOLUME Syndrome is beginning to be replaced by Value Demand. Now this is an equation that all patients like. I like it. You should like it. We are all patients at some point. “Patient Centeredness”. It’s about VALUE. Increase the numerator, decrease the denominator. Unfortunately, for the most part, we are not often incented well enough to provide maximum VALUE. We still live in a Volume-Based, Fee for Service World. But incentives are slowly starting to change. Michael Porter, Harvard Business School, and Thomas Lee, Press Ganey, in their visionary article “The Strategy that Will Fix Health Care” describe how true patient centered behavior provided through innovative, collaborative teams will reduce costs and improve health care quality. (http://hbr.org/search/The%20Strategy%20that%20will%20fix%20health%20care%20Porter/0) . In their eye-opening white paper “The Volume to Value Revolution”, Adrian Slywotzky and Tom Main of the Oliver Wyman group describe many examples of value based care models that because they are incented through risk-sharing, value-based payment models, improve patient health and reduce global costs (http://www.oliverwyman.com/volume-to-value-revolution.htm#.UsmsXXkRXgI). We have experienced highly positive results at Therapy Partners where we have helped networks of independent therapy practices in several states attain value-based contracts using FOTO outcomes (www.fotoinc.com). They create win-win-win arrangements for the 3 Ps – Patients, Providers, and Payors. Patients receive better quality care. Therapy Providers receive a financial reward for higher outcomes. Payors can see reduced direct costs for therapy and lower total costs for all health care services. 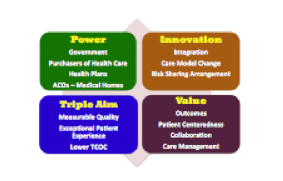 Physical therapists can bring value to and connect with The Powers, through a Triple Aim Mission, a Value Focused Culture, and Innovative Strategy. Visionary physical therapists leading high performing teams of talented therapists have an opportunity to bring measurable value to the health care delivery system, and, yes . . . be rewarded for that value. The market is ripe for value. Look at the stark contrast for physical therapists. When financial incentives change 180°, provider behavior must change commensurately. Challenging? Definitely, but with innovation, effective leadership, and strong teams, it can be done, and it will be fun, because it brings value to our patients. And that’s why we got into physical therapy in the first place. So is health care reform a threat or an opportunity? Jim Hoyme is a partner in a 10 clinic practice, OSI Physical Therapy based in Stillwater, Minnesota. He is also one of the principle owners of Therapy Partners, Inc. an outcomes-based consulting group which works with networks of independent practices to attain and succeed in risk sharing arrangements with health plans and ACOs. He also helped develop an innovative leadership program called The Leadership Edge, which Therapy Partners provides to students, faculty, independent practices, and health care leadership teams. 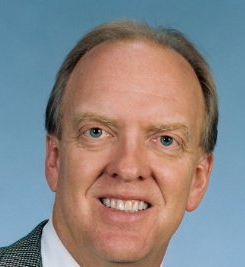 Jim has an MBA with a focus on organizational leadership.